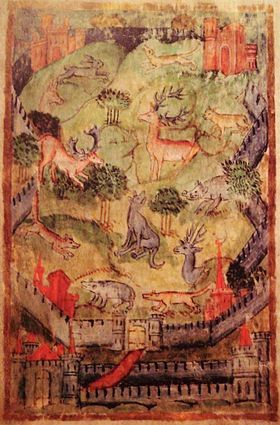 A medieval deer park was an enclosed area containing deer. Hortulus: The Online Graduate Journal of Medieval Studies is a refereed journal devoted to the literature, history, and culture of the medieval world. Published electronically twice a year, its mission is to present a forum in which graduate students from around the globe may share their ideas. Article submissions on the selected theme are welcome in any discipline and period of Medieval Studies. We are also interested in book reviews on recent works of interest to a broad audience of Medieval Studies scholars. Recently, place and space theories have manifested themselves in Medieval Studies in a number of ways, from analysis of specific spaces and places, such as gardens, forests, cities, and the court, to spatially theorized topics such as travel narratives, nationalism, and the open- or closedness of specific medieval cultural areas. Over an array of subjects, the spatial turn challenges scholars to re-think how humans create the world around them, through both physical and mental processes. Articles should explore the meaning of space/place in the past by situating it in its precise historical context. The 2011 issue of Hortulus: The Online Graduate Journal of Medieval Studies will be published in May of 2012.
submit@hortulus.net by March 1, 2012.